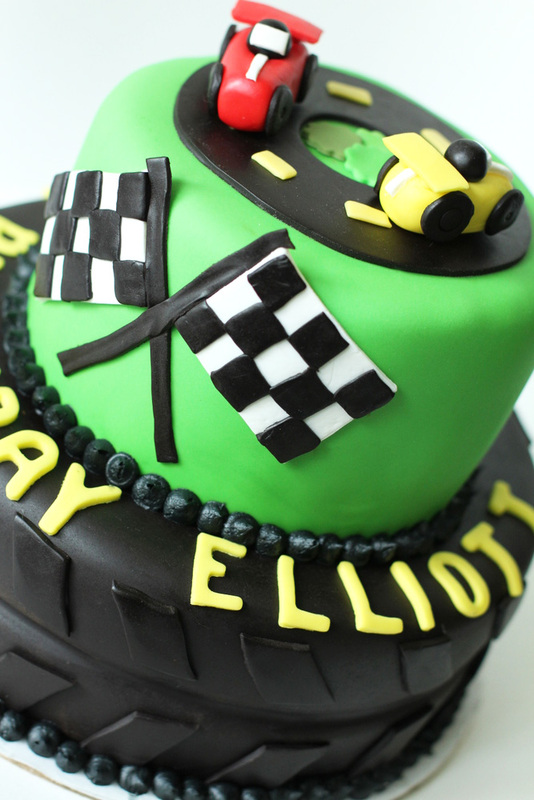 I saw a tutorial for these adorable racecar toppers, on the Cake Journal site, several weeks ago, and was ecstatic when Elliott decided he wanted a racecar cake for his birthday! The tutorial is excellent! I did not, however, have all the supplies, so I improvised a little, but I still think they turned out great. When looking at tutorials, don’t get overwhelmed with materials you may not have, you can usually cope with the materials you do have on hand (okay, I realize not everyone has fondant in the basement). 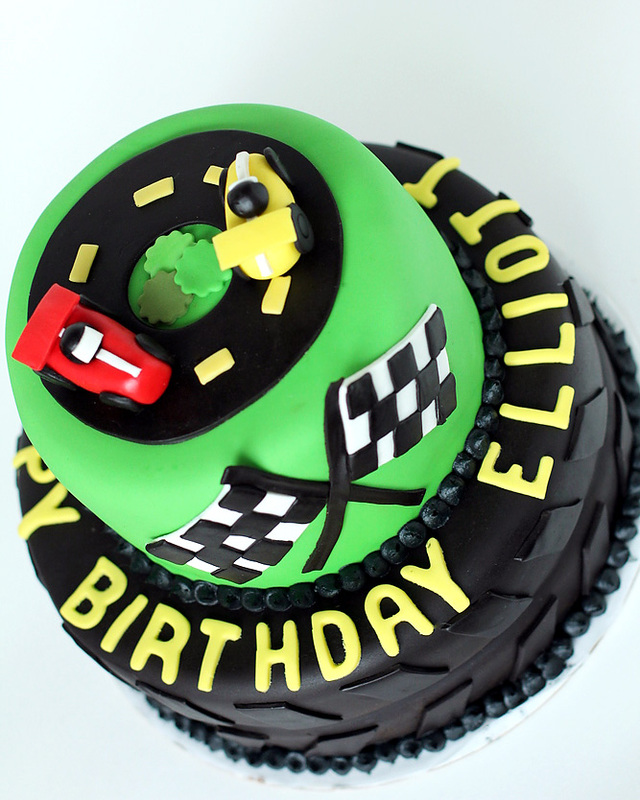 As a novice cake decorator, I adapted the tutorial by using mostly fondant, instead of gumpaste, since I already had the fondant colored appropriately for the racecars. I used plain water to adhere the separate pieces, instead of tylo glue (shhh… I truly have no idea what that is). I only have one fondant smoother, so instead of using a pair of fondant smoothers to shape the car, I used my one fondant smoother and a box of graham crackers! In addition to the racecar toppers, I was pretty excited with the completed first tier tire! I’m not sure the parents were as excited about all that black fondant, but I think it was totally worth it! It might be fun to try and make a giant tire cake sometime! Confession of a Wannabe Foodie… Sometimes life gets a bit hectic and I may have to get creative to finish everything in time. After all those years of criticizing my mother for putting baked goods in the freezer, I did the unthinkable… I made homemade chocolate cakes the weekend before the event, let them cool, then immediately wrapped them in clingwrap, foil, and a zip lock bag and tossed them in the freezer for a few days. And now, for the ultimate confession of all… I will totally do this again!! Cindy, I only froze the cake for a few days, but it really did turn out great! I’m not sure how long they stay fresh in the freezer, but one week, well-wrapped, worked great! I know two little guys who would die for one of these. Do you take orders? I can’t believe how great this cake looks. I’m lucky if I can just use a cake mix and colored icing. I think we may have to put in an order for Lee’s special little girl, but you’ll need to think PINK!